At the end of January, Windward held their annual “holiday” get together. We take time after the holidays, to get the firm and significant others together to get out of the office and do something fun. 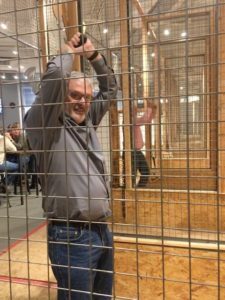 This year, we went axe throwing! What? Yes, axe throwing! There are a couple locations in the Kansas City area where you can do this. They train you on how to throw and teach how to do it safely. Talk about releasing some tension! 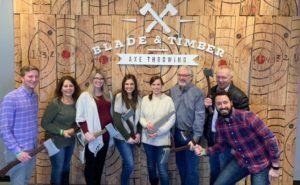 We went to Blade and Timber in Leawood. It was a great time! We all enjoyed it and learned that Emily and Darrell probably shouldn’t quit their day jobs to take up axe throwing.